A locally sourced lunch spread at Jose Enrique. 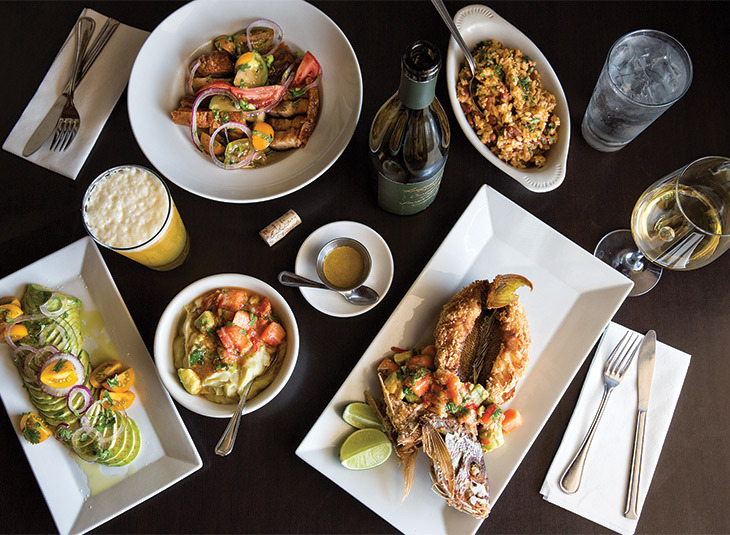 Puerto Rico’s culinary landscape ventures beyond rice and beans. 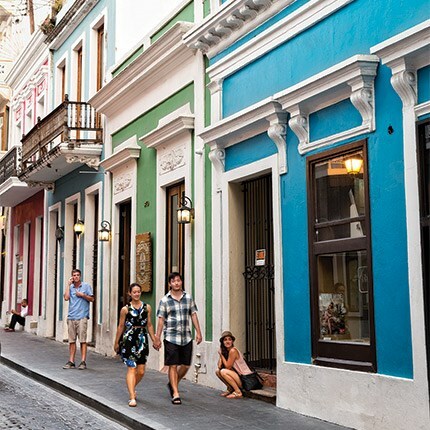 A colorful stroll in Old San Juan. Fern at The St. Regis Bahia Beach Resort. El Departamento de la Comida is distinctly of Puerto Rico: A casual, open-air restaurant with palm trees, a grapevine canopy, and a wooden bar. But the menu, colorfully scrawled on a mini whiteboard, is not. It’s all vegetarian – gazpacho, mashed green plantains with chayote and kale – and completely sourced from local and sustainable farms. On an island proud of its cocina criolla, a style of cuisine heavy on the starch and liberal with the deep fryer, El Departamento is part of a newer – and fresher – way of thinking. The lush, mountainous Caribbean island has always had good soil and a favorable climate, but its history skews far more industrial than agricultural. For decades, Puerto Rico has imported more than 80 percent of its food. Lately though, that’s beginning to change, and travelers – including my fiancé and me, who have come for a few days of warm weather and culinary exploration – are reaping the benefits. Gazpacho from El Departamento de la Comida. Tara Rodríguez Besosa started El Departamento de la Comida (The Department of Food) as a CSA project in 2010 before opening a restaurant in a converted San Juan warehouse a year later. El Departamento moved into its current, more inviting space in San Juan’s Loíza neighborhood earlier this year. Besosa’s mission is twofold: to help farmers grow their businesses and to introduce locals to the bounty that’s right in front of them. Twenty minutes away, among the colorful buildings and narrow cobblestoned streets of Old San Juan, local produce stars in the tasting menu at Marmalade, a stylish, low-lit space off Calle Fortaleza. Chef Peter Schintler has worked with island farmers for more than a decade to source heirloom beets, grapefruit, and other fruits and vegetables, and he’s seen his network grow. Puerto Rico native and James Beard-recognized chef Jose Enrique buys daily from local producers for his eponymous restaurant in San Juan’s Santurce neighborhood, a casual, homey space where patrons clamor nightly for one of 18 tables. The afternoon we’re there, Enrique stops by our table to say hello, then heads out to buy spices for the fresh lobsters he just got his hands on. It’s easier for smaller restaurants to source locally – they can alter their menus on a whim – but the more expansive fine-dining outlets at the island’s resorts are catching on too. Fern, a contemporary restaurant at The St. Regis Bahia Beach Resort, orders local and sources from its own on-site garden and hen coop. On our last day in Puerto Rico, my fiancé and I follow the advice of our server at Marmalade to go for a drive and stop at one of the island’s many roadside food kiosks. We end up at Luquillo Beach, a palm-tree-lined crescent of sand an hour east of San Juan that looks like the idyllic backdrop for a beer commercial. We wash freshly caught grouper down with bottles of Medalla, and I realize that going straight to the source in Puerto Rico feels easier than ever before. We have dinner reservations in a couple of hours, but we order seconds anyway. Chef Juan Jose Cuevas of 1919. Chef and Puerto Rico native Juan José Cuevas puts a local spin on contemporary American cuisine at 1919, a swanky space in the Condado Vanderbilt hotel. Order This: Lamb loin with rice, steamed eggplant, and Thai vinaigrette. 1055 Avenida Ashford, San Juan. Half produce market, half restaurant, vegetarian El Departamento de la Comida is one of the only establishments in Puerto Rico that sources all of its ingredients entirely from local farmers. Order This: The veggie burger (made with quinoa, kale, chia seeds, and basmati rice), with locally baked bread and fresh greens. 2413 Calle Laurel, San Juan. Puerto Rican flavors infuse French chef Jean-Georges Vongerichten’s recipes at Fern, a breezy space on the second floor of the Plantation House at The St. Regis Bahia Beach Resort. Order This: Wood-fired avocado pizza, topped with olive oil, avocado, cilantro, lime, and jalapeños. State Road 187, Rio Grande. Low-key waiters carry a whiteboard that displays the flavorfully prepared options at Jose Enrique, a bring-your-own-bottle space in Santurce. Order This: Balaju, a local sardinelike needlefish, fried and served whole with a side of housemade hot sauce. 176 Calle Duffaut, San Juan. Marmalade’s beautiful 4- to 15-course tasting menus feature vegetable-heavy dishes paired with chef Peter Schintler’s extensive wine collection, all in a modern lounge setting in Old San Juan. Order This: The signature white bean soup with scallions, black truffle oil, and pancetta. 317 Calle Fortaleza, San Juan. Atlantic Ocean views from the Condado Vanderbilt's pool deck. A $200 million renovation recently added new guest rooms, pool areas, and a 10,000-square-foot spa to the 319-room Condado Vanderbilt, a modern space towering over Condado, San Juan’s oceanfront neighborhood that buzzes with bars and high-end shopping. Dorado Beach, a Ritz-Carlton Reserve occupies a prime swath of beachfront land once owned by Laurance Rockefeller. Make reservations at Mi Casa, the 115-room resort’s fine-dining restaurant from acclaimed Spanish-born chef José Andrés. Housed in a former convent, Old San Juan’s 58-room Hotel El Convento is a quick walk from restaurants, shopping, and Castillo San Felipe del Morro, Puerto Rico’s sixteenth-century citadel. The secluded, 139-room St. Regis Bahia Beach Resort, on a former coconut plantation in Rio Grande, keeps guests busy with golf, bird-watching, and trips to nearby El Yunque National Forest. Originally appeared in the September 2016 issue of Virtuoso Life.